This weekend was mostly spent outside. The weather has been in the 50’s and its starting to feel like spring. I am sure we will get one more snow storm of the year, but for the meantime I am going to soak up the sun. On Saturday we sat outside in the sun even though it was a little windy, then that evening we went out to eat with the neighbors in the condo association. The joke was we the entire trailer park was going out to eat. We dined at The Outback, the first time I ate there in Cedar Rapids. Last time I ate at the outback I was not impressed with their steaks, since I love to cover my steak with garlic salt, so I ordered a bacon cheeseburger mmmm. Sunday was also slack, we went for a bike ride, only rode about 2 miles, but thats far when I got the cart with kids on it. Well that concludes my weekend enjoy now its time for bed. Alright I wrote a review about boxee a couple of weeks ago. I stated the only reason why I am testing it out was for Hulu. Well hulu decided to give boxee the AXE, and told them they can not offer their content on boxee. Well alot of users seen this poor taste in hulu, along with putting a big hurt on boxee as I see Hulu as the Holy Grail of internet tv. Well today boxee released a new version that is running off RSS feeds. While hulu could block it, I think it would be a bad idea. I downloaded the new version its very very buggy, and has crashed on me a couple of times. Users are also reporting that hulu isnt work, I also could not get hulu working. So if boxee said they will put an update in to alert the user if its up and running or not. Hopefully hulu gives in and lets Boxee Stay. Alright to be honest I am writing a review so I can post my referal link to try to get more space on dropbox. Here is the referal link. If you sign up, you and I will both get 250 more MB on top of the 2 Gbytes. So if you sign up, I thank you in advance!!. With that note if your a current user of dropbox, you can get more space by following this link. 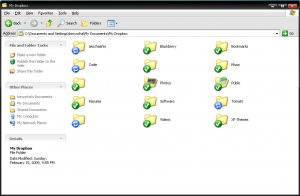 Dropbox allows you to have a common folder on multiple computers and the web. So you install dropbox on the computers you want to sync folders with. I believe the default Windows XP folder is ( C:\Documents and Settings\%USERNAME%\My Documents\My Dropbox ) But you can move it around. 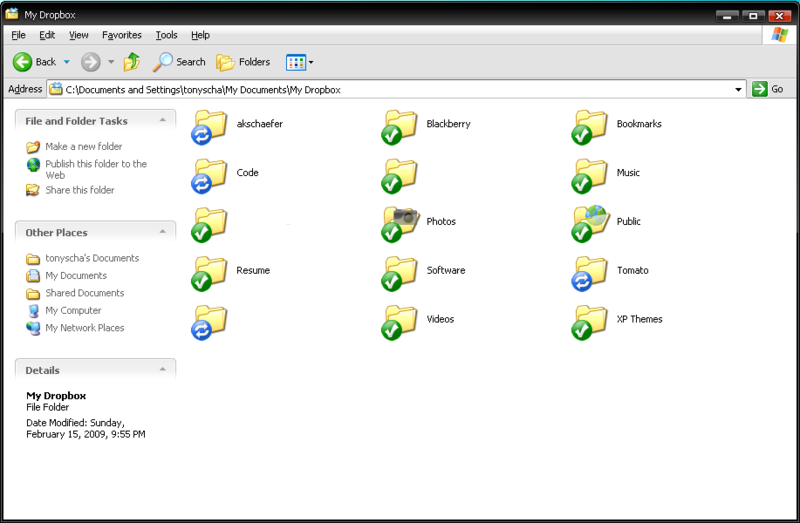 Then any files or folders you drop in there are synced with the online dropbox website. If you have multiple computers each computer will receive updates of the new files synced. I currently have a ubuntu, Windows xp, and Windows Vista Box synced up. It also has a OS X installer. It works very well to always have the files I commonly use.Also if your on the go you can access the dropbox website it will allow you to download a file or look at a picture. Another nice feature is the public folder which allows you to put files you want to share with the internet. The screenshot I took shows a few folders sync ( blue arrows ) while the folder icons with green arrows are all up to date. Another thing dropbox does is puts an icon ( I know ANOTHER ICON) in your taskbar and shows a little picture if its syncing or up to date. I am not really to sure what else to say about dropbox. If you have any questions or comments leave them below. 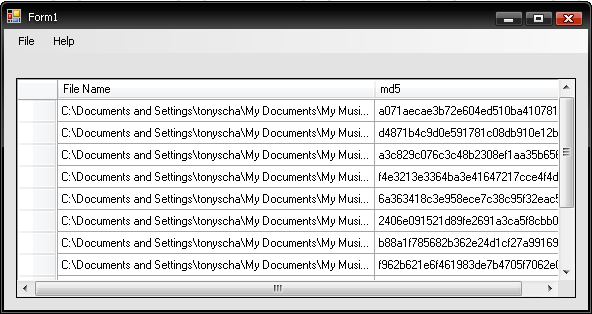 So I went ahead and made a fairly simple program that will produce md5 values of files dropped into it. You also can open files by going to file-> open file. Let me know if you find this useful. I believe this will be my first Code Post.